I’m a huge college basketball fanatic, so March is inherently one of my favorite months of the year. Never mind the 30-degree Michigan weather outside; I’m ready to hunker down inside and watch some college hoops anyway. With March comes the NCAA Division I Men’s Basketball Tournament, which I affectionately call The Big Dance. With The Big Dance, we inevitably see everybody and their brother (or sister…no sexism here) suddenly become a college basketball guru, as they fill out their bracket either by chalk (picking almost exclusively higher seeds) or by some crazy strategy (coin flips, cooler mascot, dartboard, team colors, etc.). I hate both methods, but mostly because I desperately want my statistical analysis and basketball knowledge to actually reflect in the success of filling out a bracket, and too often it is the case that it does not. Nevertheless, I will not stop in my hunt for filling out a truly great bracket. Sometimes I worry that I may have peaked in my bracket-predicting ability too young. I correctly picked the NCAA Champion 6 years in a row in a stretch from the 2001-2002 season (shout out to Steve Blake and Juan Dixon for starting the streak with the Terps) to the 2006-2007 season (How could you pick against Al Horford and Joakim Noah after winning the year before?). Starting in 2008, Kevin Love, Russell Westbrook, and UCLA let me down by falling to Memphis in the Final Four. That left a sour taste in my mouth, but not as sour as watching the star-studded Pittsburgh team I picked to win it all in 2009 (Levance Fields, DeJuan Blair, and Sam Young) fall in the Elite 8 after letting Scottie Reynolds of Nova drive coast to coast with 5 seconds left to win the game with a layup. I didn’t think it could get any worse…and that, of course, is when it gets worse. With the ballsiest three-point attempt of the decade, Ali Farokhmanesh of Northern Iowa sealed the fate of my National Championship pick Kansas in the Round of 32 in 2010; for the third straight year, things had gotten progressively worse. Fast forward ahead to 2012, and it had been 4 straight years of INCORRECTLY picking the National Champion after 6 straight years of glory. The essentially all-professional college team led by John Calipari out of Lexington was a virtual lock to win it all last year, and both my basketball knowledge and statistical analysis (which has been nicknamed “The Bracket Machine”) confirmed this. Thus, I was able to get back on the horse last year and correctly pick the NCAA Tournament Champion. However, I don’t want that streak to last a mere year, so I need to break down this year’s field and see who has the best chance to cut down the nets. Herein lies the problem; with so much more parity in college basketball this year than in past years, it is going to be very difficult to accurately pick the champion. My basketball knowledge favors one team, while “The Bracket Machine” is telling me something else. Thus, I’m going to fill out two brackets this year – one with picks from the gut, the other with picks from a statistical analysis machine. In reality, every team with a legitimate shot at making a final four run has at least one glaring weakness, and it’s just a matter of deciding which team’s weaknesses will be hidden and which will be on display. That’s what I’m here for – breaking down the final four contenders and their weaknesses, and telling you what my gut says, as well as what the machine spit out. These are the big dogs that have a very good shot at making the Final Four. I expect at least 3 of these teams to compose the group of 4 that makes it to Atlanta, with the National Champion coming from this group. 1. Louisville – Weakness: Inconsistent play from Russ Smith. Russdiculous is a great player and the Cardinals leading scorer at 18 points a game, but he is maddeningly erratic from game-to-game with his shot selection and decision-making. In Louisville’s 5 losses this season, Smith is shooting 25 for 78 from the field, so if he has a woeful game, the Cardinals could fall victim to an upset. 2. Indiana – Weakness: Tom Crean’s lack of NCAA tournament success. While Crean is generally considered one of the better coaches in all of college basketball, he’s had a surprising lack of tournament success. Since becoming a head coach in 1999 at Marquette, Crean’s only made it to the final four once (on the back of Dwayne Wade), and his career NCAA Tournament record is 7-6, which is far from sterling. 3. Kansas – Weakness: Offensive Efficiency. Kansas has improved their offense leaps and bounds since that abysmal loss to TCU earlier this year, but it’s still not pretty. This team may win with defense, but since 2003, every national champion has had an offensive efficiency above 115.5 and in the top 20 – Kansas is at 112.7 and 25th. 4. Florida – Weakness: No go-to guy. Billy Donovan’s team is very well-rounded, but they don’t have that one go-to guy that they can get the ball to in a tie game with the pressure on. Erik Murphy doesn’t have the ball skills and speed to be that guy, Scottie Wilbekin is way more of a defender than an offensive stalwart, and Kenny Boynton is too passive in settling for a jump shot. 5. Syracuse – Weakness: Mental toughness. When the going gets tough, the Orange most certainly do not get going. Boeheim and his crew had Louisville on the ropes in the first half of the Big East Championship, and at the first sign of amped up Louisville pressure and some adversity, they folded like a beach chair. 6. Ohio State – Weakness: Live and die by Deshaun Thomas. Nobody on Ohio State is averaging double figures in scoring besides Deshaun Thomas. Furthermore, Thomas has a tendency to sometimes slip into a mode where he wants to get his before he cares about the outcome for his team. If he can get a lot of touches in his sweet spot on the left block, the Buckeyes will be a tough out. By the same token, if he starts settling for contested threes, they could be an earlier out. 7. Duke – Weakness: Defense. The Blue Devils can hit shots from all over the court and score in bunches. If Cook, Kelly, and Curry are all knocking down shots, this team is damn near impossible to guard. However, they also have a tendency to fall asleep on the other end of the court and let hot shooting opponents do the same thing. Team that with the fact that they don’t have a reliable rebounder outside of Plumlee, and this team is susceptible to defeat at the hands of a more physical, grind-it-out type of team. 8. Michigan State – Weakness: Keith Appling. I don’t mean to single out one player, but in the case of the Spartans, I really have no choice. Appling is capable of being one of the better point guards in the nation, but unlike Adreian Payne and Gary Harris, he hasn’t even come close to approaching his ceiling. Unfortunately for Spartan fans, it has become a nightmarish trend to watch Appling disappear in big games, often times because he tries too hard to out-duel the opposing team’s point guard. 9. Miami (FL) – Weakness: Lack of tournament experience. Outside of Jim Larranaga’s improbable Final Four run when he was at the helm of George Mason, the members of this team (and this program in general) lack the NCAA Tournament pedigree and experience. Handling the moment when you’ve never been there before can be quite a challenge, even for a starting lineup filled with 4 seniors. These teams have a solid shot of sneaking out of their regional (one of them will probably pull it off) and getting to Atlanta, but might not have quite enough firepower, experience, or clutch to win the whole thing. 1. Gonzaga – Weakness: Haven’t been tested because of soft schedule. I will give credit to the Zags for going out and playing at Oklahoma State and at Butler, and having Illinois and Kansas State come out to Spokane. However, they went 2-2 in those games against teams whose average seed line in this tournament is 5.5. What’s going to happen when they have to consistently match up with the big boys and win multiple games in a row to survive? 2. Michigan – Weakness: Playing soft. The Wolverines are great on the offensive end of the floor and have two NBA-caliber guards in Trey Burke and Tim Hardaway Jr.. However, on the defensive end, they struggle with being physical and stopping dribble penetration using guard-to-guard help. John Beilein’s defensive strategies of avoiding fouls and switching ball-screens have been figured out and exploited by Big Ten teams this season, so it’ll be a matter of how he adjusts going into the tournament. 3. Wisconsin – Weakness: Inability to play from behind. If you’re in to fundamentally-sound, slow, methodical basketball on both ends of the court, then Wisconsin basketball is for you. Unfortunately, this style does not lend itself to comebacks and playing from behind, something a team must be capable of doing in order to make a run in the tournament. If Wisconsin lets a team get hot from the field early, they could be leaving the tournament early. 4. New Mexico – Weakness: A tendency to go ice cold from the field. The Lobos play some very effective defense, are athletic, and really take care of the ball. However, they averaged under 58 points per game in their 5 losses this season – a number which was actually significantly inflated by a 89-88 loss to Air Force to end the regular season. It’s hard to see them finding ways to consistently outscore opponents and make a deep run with such inconsistent shooting performances. 5. Georgetown – Weakness: Otto Porter Jr. can’t do everything in every game. Porter leads the Hoyas in points per game, rebounds, steals, blocks, free throw percentage, three point percentage, and minutes per game. He is mister do-it-all for John Thompson III and crew, and has been an All-American up to this point in the season. However, at some point, he’s going to get burnt out and need his teammates to pick up the slack – something I’m not sure they are all that capable of doing. There are a lot of crazies out there that love picking a good dark horse to pull some stellar upsets and make a run; if you’re going to do that, I suggest you pick from this list. 1. Saint Louis – Weakness: Putting the ball in the basket. The Billikens take care of the basketball and don’t give up any easy baskets on the defensive end of the court. However, in order to string together multiple wins in this tournament, you have to be able to get some easy baskets and score the ball. This well-rounded team has the capability to make a run based on their defense, but could get tripped up early if they continue to struggle on the offensive end. 2. 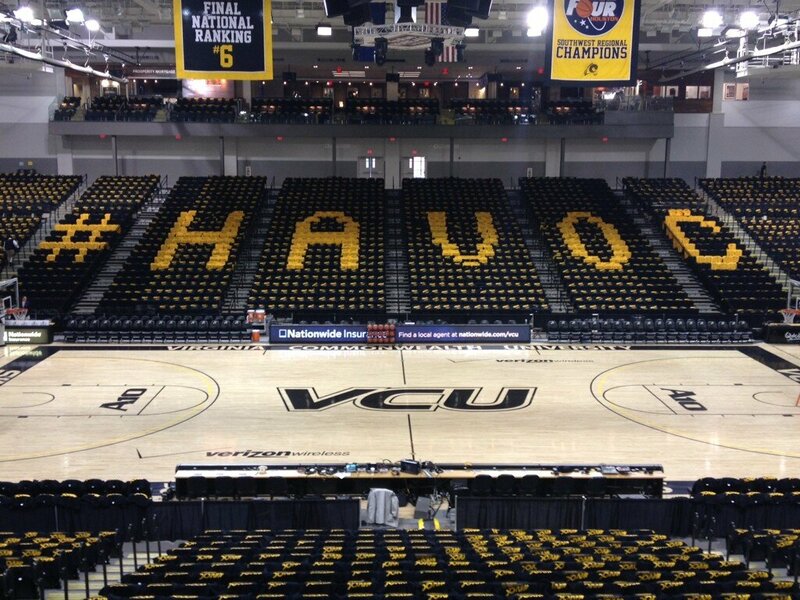 VCU – Weakness: Facing teams that don’t turn the ball over. The “Havoc” defense that Shaka Smart and his deep, athletic team employee on a game-to-game basis can cause opposing coaches hairs to turn gray. However, when the opposing team handles the pressure and limits their turnovers, VCU becomes a surprisingly average team on both the offensive and defensive end, as well as on the glass. 3. North Carolina – Weakness: Playing defense with a small lineup. North Carolina has experienced some great success this season ever since Roy Williams switched to his newfound, smaller, four-guard lineup. That being said, this lineup has caused North Carolina to fall into stretches where defense and consistent rebounding disappear, and those are obviously two things that can’t happen if UNC wants to make a run this year. 4. NC State – Weakness: A lack of passion, heart, and emotion. NC State is one of the most athletic, talented, and capable teams in the entire tournament. However, they’re also one of the most underachieving, and have been all season long. Richard Howell is a man among boys, Scott Wood consistently knocks down threes, and C.J. Leslie is a freak athlete and player. Unfortunately, it is too often the case that I’ve seen this team not handle adversity well this season, and play emotionless, passionless basketball. After all the basketball I’ve watched and all the numbers I’ve crunched, I still can’t quite make a decision on who to pick as my National Champion. Having watched the copious amounts of college basketball I’ve watched this season, my gut tells me that Indiana is the best basketball team in the country. The statistical analysis from “The Bracket Machine” seems to believe that Louisville is the team to beat. Either way, I really hope these two teams meet in Atlanta on Monday, April 8th (assuming, of course, that my alma mater falls short of the championship), because that would be one hell of a matchup for a chance to hold up the trophy.